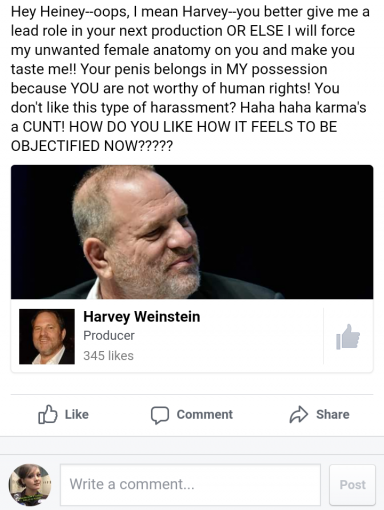 Karma alert: Harvey Weinstein has been sexually harassed! THE DIRTY ARMY: Nik, looks like the backlash against Harvey Weinstein has taken an even bigger twist and turn: now young girls are taking to social media to show him how it feels by harassing HIM! Threats that he needs to cast them acting roles “or else.” Blatantly telling him he isn’t in control of his own private parts. Is this justified or just as disgusting as what he’s done? This is one of the most stupid things ive ever seen. Ima Thurmans comment, made me think of a Watergate figure who said about an opponent, “Let him (Harvey) dangle slowly, slowly in the wind”.